As we may notice, the number of people taking flight in and out from Soekarno-Hatta International Airport is much higher nowadays compared to the past. Whether it is for business purpose or leisure only, plus, the variety of airlines with airfare that is also getting more affordable, has made taking flight as the preferred way to travel for most people. We have not yet mentioned travelers that fly from one city or country to another and choose to transit on Jakarta and possibly stay for few days. The scene of people with big and small bags lining up for transportation and hoping to leave the airport and get home as fast as possible is very common. For those who have more budget, they can right away opt for a taxi ride and off they go. However, for those who may not have or simply just want to cut down the expenses, may find taking other available public transportation as the only option – although this might bring them to a scenario where they have to take one bus then transfer to another bus and another one more perhaps just to reach their destination. If I were in that scenario, up and down the buses with all my belongings, it is quite a nightmare – in my imagination. Weight-lifting exercise is good, but not with my bags and luggage. Ok, assume that even with not that many belongings, it is still quite a hassle, especially for those who are not familiar with the transportation system in Jakarta, such as the temporary visitors that I mentioned above. Taxis and long-distance buses such as Damri are already available at the airport for a long time, however, BPTJ* (Badan Pengelola Transportasi Jabodetabek) sees the need to come out with another transportation solution to resolve the imbalance growth between demand and supply of transportation at the airport. Hence, JAConnexion was born. *BPTJ is the unit under government sector handling transportation system matters in Jabodetabek (Jakarta, Bogor, Depok, Tangerang, and Bekasi) area. Last week, me and few of my friends got the privilege to experience the JAConnexion ride from Grand Indonesia to Soekarno-Hatta Airport and learned more about JAConnexion. We had a great Q & A morning session as well with Mr. Benny, the Head of Public Relation of BPTJ, and the management team of Big Bird about how JAConnexion as a bus shuttle services can support transportation system in Jakarta and around. JAConnexion is a project by BPTJ supported by Blue Bird that works as an alternative method of transportation targeting people who are going to any major hotels or shopping malls in Jakarta from Soekarno-Hatta Airport. 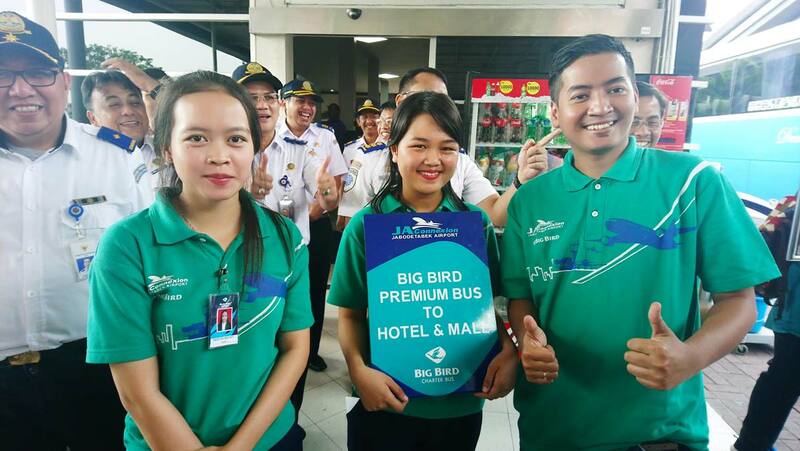 At a flat rate of IDR75.000,- per trip per pax (launch promo price is at IDR50.000,-), passengers can hop on to the Big Bird coach by Blue Bird and get to the destination at peace of mind. The routes of JAConnexion will be developed further along if they see the needs arise. JAConnexion is a direct point-to-point coach service; it will only let passengers alight at the places stated on each route. So, passengers shall expect a big cut down of time by not making unnecessary stops. Another great thing about JAConnexion is their schedule is fixed, so, passengers can plan their time ahead well. Besides that, the coach used by JAConnexion is the Big Bird, a 24-seaters bus, by Blue Bird Group which uphold its good reputation for the longest as I can remember. So, no doubt for the safety and services they offer. There are facilities like complimentary wi-fi services and shared TV which we can enjoy once we are on board. Although it is not available on every seat, however, if our mobile phone in an emergency state and going to die soon, there are few USB outlet plug available on the overhead compartment to save our day while we are on our way, too. There is no official counter desk for the JAConnexion yet at the time I am writing this. So, once we get out from the terminal building, you will spot the green shirt staffs standing by in front of the terminal building holding a JAConnexion signboard. They will assist you how to get on to the bus and obtain your pass. We can pay the fare on board, hassle-free. Otherwise, head on to the bus counters at the opposite of the terminal building where usually Damri buses and other buses stationed to find one. JAConnexion is a great move from BPTJ because it connects the most important gateway of Jakarta, Soekarno-Hatta Airport, right to the few selected hotels and malls in the central of the city. There are countries I visited before that has this kind of shuttle services, too, and I find it is really helpful. Although we may not be staying at the hotel or intending to go to the shopping mall stated on the JAConnexion routes, but at least if we are heading in the same direction, we can take JAConnexion to get there in the more comfortable way. Then we can continue by taking another method of transportation to get to our destination. Since I am back to Jakarta, I hardly or I would say I never take a public bus ride. Yes, I am pampered and a lazy bump, I don’t like to squeeze inside a bus especially in Jakarta. But I won’t mind taking JAConnexion as they limit the number of the passenger to board. Besides that, it is also cost-efficient especially when you travel alone. You do your own calculation. If it is better, why not? What do you think of JAConnexion shuttle service? Is there any such shuttle bus service at the nearest airport to your city? Feel free to leave me your thoughts in the comment box below.